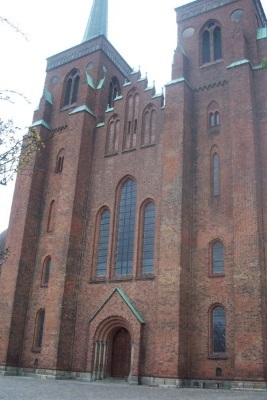 Roskilde Cathedral is made of red brick in the Gothic style, and dates from about 1280. Since then each century has added its own extensions in various styles. The interior of the cathedral has been changed in the course of time too. Before 1536 the cathedral was Catholic. After the Reformation the side altars were removed and new furniture was installed for the new Protestant service. 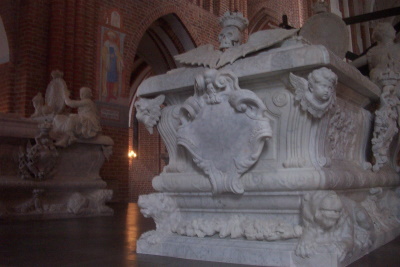 Roskilde Cathedral was admitted to the World Heritage List in 1995. 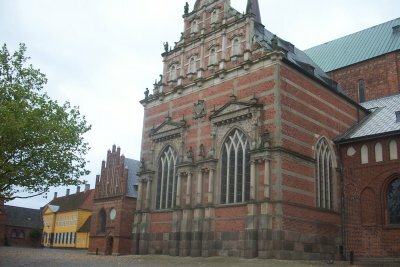 As reasons for inclusion its role in the use of brick for religious buildings, the succesive architectural styles and the mausoleum of the Danish Royal Family were named. Of the about 100 Christian sites (churches, cathedrals, monasteries) on the List, only a few are related to Protestantism. The Luther memorials in Germany are the most prominent example of these. 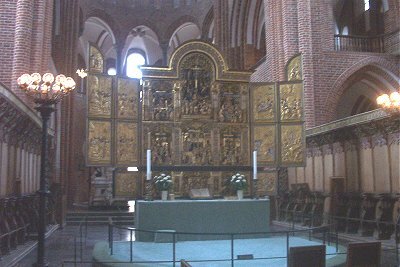 Roskilde Cathedral is another one: not so obvious maybe (it started out as a Catholic church), but the Reformation had a profound influence here. The interior was profoundly changed after the transition to Protestantism. In a way, its brick walls (already devised in the 1170's) add to the purity and austerity of the Reformation too. Usually I don't get too excited about visiting another Gothic cathedral, but I must admit that this one has something 'extra' that a spot in the Top 1000 of world monuments seems to be deserved. This 'extra' can be contributed to it being Protestant (as explained above), but also to all add-ons that were attached over the ages. Each chapel has its own look, both inside and outside, and is an example of the fashionable architectural style during the period of its construction. One of the most beautoful of these, the Chapel of the Magi (1463), unfortunately was closed for restoration when I visited. However you can peek inside and admire its delicate mural paintings. Roskilde, as a former capital is well-worth the excursion from Copenhagen. The dizzying cathedral is a towering structure that should be admired by a full 360 degree exploration of the surrounding grounds. I photographed every corner of the interior, and viewed the cathedral from several different vantage points. During my visit the Summer weather was excellent, so it made the visit that much more pleasant. The amount of royal tombs/caskets located inside the cathedral itself is surprising. Certain areas within the cathedral are quite different because of the internment of a particular monarch. More prominent personas and the century they died all create a varied interior that is quite different from the monotonous interior of many other cathedrals. I spent half-a-day here visiting the cathedral and the Viking Ship museum, which is also worth exploring via the forested road directly across from Roskilde Cathedral. I should mention, the Copenhagen card is quite useful for a multi-day visit to Denmark. Trains outside Copenhagen are included, as well as admission to Roskilde Cathedral, and several other important sites in North Zealand. I visited this WHS in July 2016. I've visited Copenhagen four times without visiting this very close WHS but I finally made it. I was lucky that another 3 WHS were added in the area so time was ripe for a visit. I spent a whole day in Roskilde. Before checking-in in my hotel at night time, I stopped by a parking lot close to the Vikings Museum to be able to see the panoramic view of the lateral side of the cathedral and the remains of the two viking ships lit at night. Very early the next morning I woke up at around 06:30 and made the most of the perfect blue skies and morning light for photography. The facade is best viewed in the afternoon but the steeples and rear part of the cathedral with all the statues and buildings were magnificent when the first sun rays gave the brick cathedral an even more reddish look. The UNESCO plaque is just next to the cathedral entrance. Having visited Wismar and Lubeck in Germany last year, I could appreciate the similarities between these 3 WHS. Unfortunately, like other brick churches in Germany, Roskilde suffered a huge fire in 1968 and original remains such as tiles and decorations from the Margretspiret together with vivid photos can be seen when visiting the top floor of the cathedral interior. Other brick buildings such as the town hall are worth viewing. Later on, after breakfast and lunch, I visited the cathedral interior and was given a very informative booklet/guide which was mine to keep. The cathedral interior is worth visiting. It has much more to offer than the similar brick churches in Germany. Every hour the St George and the Dragon clock comes to life as the dragon roars while being slayed by a sword. 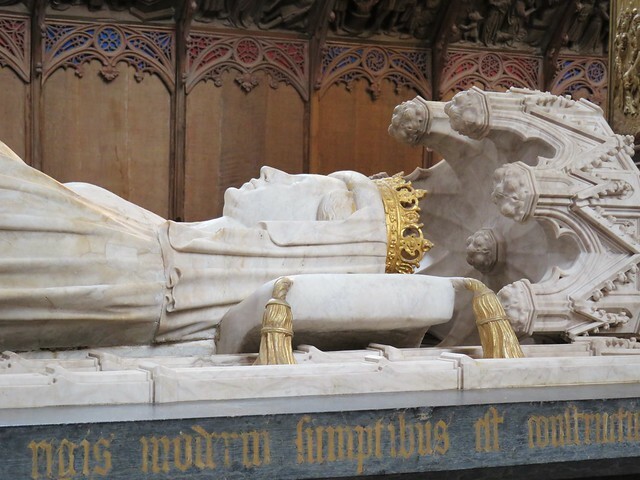 The highlight of my visit were the tombs behind the gilded altarpiece, especially the dismembered knight's tomb, and the Chapel of the Magi with the central pillar containing markings indicating the heights of royal visitors. Although there are several cathedrals inscribed as WHS this one is quite unique and I felt it deserves its inscription even though it may not be a top WHS to visit. We flew to Copenhagen on the first day of January 2016 to visit Roskilde and Kronborg. The temperature was a frosty -2°C, with a wind chill factor taking it down to -12°C. This was seriously cold as far as we were concerned! It was in Roskilde that I discovered the delights of a Scandinavian cinnamon roll...delicious. 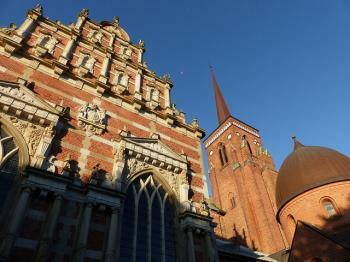 Roskilde is an imposing cathedral, but thankfully its brickwork makes it very well insulated. Its draw comes largely from the royal mausoleum. 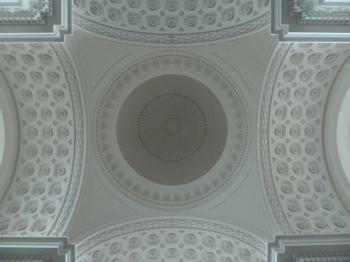 I particularly liked the Baroque chapel of Christian IV and the tomb of Christian IX & Louise. The latter is decorated with statues known as ‘the Mermaid’s sisters’ because they resemble (and are by the same sculptor as) the Little Mermaid statue in Copenhagen Harbour. Roskilde is quite a pleasant town to the west of Copenhagen, but doesn't have the same importance today as it used to have when it was the capital of Denmark and one of its religious centres. The cathedral is not only very large, but is also the necropolis of the Danish royal family, resulting in a large number of graves and tombstones from many centuries. For a Protestant church, it is rather lavishly decorated, and is unique for its brick architecture. Don't miss the other major highlight of Roskilde, though - the great Viking Ship Museum, only 10-minute walk away. It shows several original ships from the Viking era, and you can also set sail in a rebuilt Viking ship, which is really a unique experience. Having seen a lot of cathedrals in the process of visiting World Heritage Sites, it takes something a little different to linger in my memory. Roskilde certainly does that. As Els points out it is a Protestant cathedral, and this means that it has a slightly austere brick and whitewash interior. This was actually very impressive and helped to focus attention on the other artistic details, and I guess for parishioners there it helps them focus on their worship. I really enjoyed studying the intense detail of the carved altar piece and choir stalls, which were elegantly lit and open to allow close inspection. The main thing that impressed me though was the side chapels with the tombs of Danish royalty. This was a big surprise to me as this type of monument normally leaves me indifferent. They were very elegant, and the use of space within the chapels was very restrained. At no stage was I overwhelmed by what I was seeing, this allowed my focus to remain on the works of art. This may not be the most impressive looking cathedral interior on the list, but actually that is its main advantage. I almost missed seeing the interior, but I am very glad that I made time for the short hop out from Copenhagen to get inside. The exterior of the cathedral is nice but not particularly remarkable, but the real highlight is the restrained yet outstanding interior. 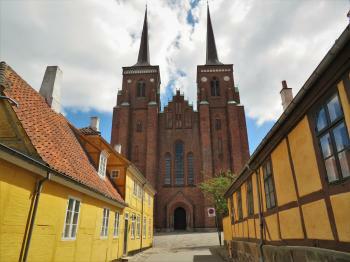 Roskilde is a little different to the other European Cathedrals on the list and well worth a trip to see. If frankly - I was not especially impressed by this monument. I appreciate the tremendous historical importance of this church for Denmark - but visually, especially from outside - not a world-class monument. it is a travel back in time. the magnificence of its architecture, and everything around and inside the place is a work of art and inspiration. the column that inscribes the height of each prince and princess as they visit each time, immortalizes the history of the monarchy. the tomb also will give you in detail the love and care, that they have for each other. it is truly a place to see. Bureau - until a comparative study on religious brick Gothic architecture is completed. Peter the Great : Measured there ((208.4cm!) in 1716 at the so called King's Pillar, where numerous kings have had their height measured over the years. 244 Community Members have visited.